New Year FreebieHappy New Year! Here is a new freebie for you to kick off the New Year! 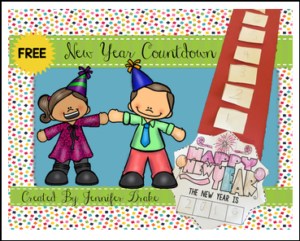 Students love counting down to the New Year- turn it into a math lesson activity! *Aligns with and supports Common Core Learning Standards and makes a cute display to welcome in the New Year! *Since students write in the New Year, this activity can be used year after year! Find more New Year themed activities and centers click HERE! Looking for more ‘New Year,’ ‘math’ ‘centers’ and/or counting fun? Visit My TpT Storeand click on the custom categories that best match what you are looking for! Happy New Year Countdown Fun!